During the 2011-2012 school year, I worked with eighth grade students to motivate, engage and empower them to pay attention to and understand/retain content in the Sciences (Space weather). The bigger picture involved us with NASA’s Magnetospheric Multiscale (MMS) mission: a Solar Terrestrial Probes mission comprising four identically instrumented spacecraft that will use Earth’s magnetosphere as a laboratory to study the microphysics of three fundamental plasma processes: magnetic reconnection, energetic particle acceleration, and turbulence. The mission will be launched in October of this year (2014). The above processes are not only a “mouthful”, but also an immediate put-off for today’s young generation mainly because they (processes) are perceived as difficult and boring. Difficulty calls forth boredom for their young minds … any mind, perhaps … and consequently, there is no appreciable interest. In order to generate interest and defuse this perceived difficulty, knowledge visualization was pursued to make Digital Art – a tangible product (byproduct) of the creative process in support of the cognitive aspects of the information found and its understanding. The creation of art – the making of something that comes from “within” – has always been a boon for the psyche, a gratifying experience that adds to self-esteem and provides relevance. This creative experience is surround and exciting, which leads to greater motivation for a greater understanding and retention of content. There is a phrase for this action – moving STEM (Science, Technology, Engineering, Mathematics) towards STEAM (STEM with an Arts component). To combine the Arts with STEM is to motivate, engage and empower. The above images were made in a graphic arts software program. We are looking at the results of a great deal of cognitive effort via research and creative fervor via the tools and filters of the program. Again, these students and their classmates took the Science research in stride because of the anticipation of making art. They utilized various NASA web pages and images to have a better understanding of Space weather and the purpose of the NASA mission. On a philosophical bent, a theater mask – an art piece in itself – is the means for the performer to understand and translate the drama and/or dance on stage. So is the art piece that is created in the classroom by the student to understand and explain subject content. These creative and cognitive experiences lead to greater understanding/retention of and an appreciation for STEM and its motivating component, the Arts – STEAM. They were empowered. The students at the other school district were not only motivated because of the “wired” approach of studying and creating Digital Art, but also because of the peer teaching. Or in other words, they were within their social context and the digital environment. The topic of Space weather is about as far away from middle school students’ minds as the Moon or even Mars. It registers one or less on the Richter Scale for these youngsters who are more interested in social networking on their cellphones than wading through information to gain an understanding of Space weather that comprises a glossary of over 40 terms such as: aurora, chromosphere, coronal mass ejection (CME), electromagnetic spectrum, heliosphere, magnetosphere, prominences, spectrum, solar wind, and others. And when a complex project like NASA’s Magnetospheric Multiscale mission – slated for launch in October of this year (2014) to study Space weather – is added to the [lesson-plan] equation, the task for the teacher becomes formidable or even doubtable. In order to move these students in the direction of real desire and commitment to an assignment such as this, a “wired” and holistic approach is needed which parallels who they are and what they do as “digital natives”. The above images and numerous images by other students reflect an enthusiasm for the topics – Space weather and NASA’s Magnetospheric Multiscale mission – because they were given an opportunity to immerse themselves in the “digital world” with creative control for generating or creating “product” – Digital Art. This teacher (author) heard time and time again from the students, “This is really cool!” What they meant is that the process of dealing with complex topics in a “wired” and creative way (visualization) – and their way (“id” control) – was an exciting and satisfying experience. Unbeknownst to them, perhaps, is the fact that they indeed took part in a regimen of study regarding the Sciences. To add transcendence, and play to their (students’) social instincts, it was also understood at the onset of the lesson plan that they would convey their knowledge (gained) and graphic arts software skills (acquired) to students at another school district. They would become tutors – mentors – of others. This understanding was also a motivating factor for the students to proceed with the research. When we look at the above images, in my mind there is an immediate vehicle to motivate students to work with calculations and mathematical relationships. Again, the cognitive and creative processes mesh as the students isolate and magnify pixels from images (random) in graphic arts software to then calculate values (perimeter, area) and establish relationships (ratios). In an aesthetic sense, they make Digital Art and in this case, within specific genres – Abstraction/Minimalism. The above images are courtesy of Google Earth, and they show crop circles made by farmers in the Panhandle of Texas. These “Earth canvases” (Found Art) are a testament to the farmers’ intuitive nature and mathematical skill of working with the dynamics of the circle and within the confines of a square (plot of land) to irrigate their crops. What is interesting is when these circle-square configurations are viewed as aerial landscapes (similar to “Aeropaintings” [“Futurism”]), they rival the works of some non-objective artists; and what is more meaningful, perhaps, is that they can be used in the classroom (field) for mathematical calculations (perimeter, area, circumference) and relationships (ratios, percentages). The science of accurately determining the terrestrial or three-dimensional position of points and the distances and angles between them – surveying or land surveying – can also be introduced as an additional component to the process since Mathematics is used to establish land maps and boundaries for ownership. Maximizing cognitive learning through knowledge visualization extends in all directions – disciplines – and by doing so, helps to combat aliteracy, the state of being able to read but being uninterested in doing so. I immersed students in various projects that centered around relevance and visualization of content – exciting and motivating for them – and they were also required to do research (as mentioned), which required reading to support the projects. They took the reading in stride – moved away from their lethargic and alliterate behavior – because of the nature (mode of application) of the projects. Content relevance, hands-on hardware/software and the anticipation of “product” (end result) were motivating factors in combatting aliteracy amongst the student population. History may be interesting for the older folk – the Baby Boom generation which I am a part of – but not for most of today’s youth. They are interested in the “now”, so well supported via the social networking tools on the Internet. They become alliterate – mentioned earlier – when asked to read and study people and events of the past. During the 2010-2011 school year, I worked with a core group of sixth and seventh grade students to add relevance to the study of History (Early American) by making a connection (field trip) with an individual – a real person who was born shortly after The American Revolution, lived through The War of 1812, and died after The Civil War – whose remains are at a cemetery, just a few feet below the headstone. When we look at the above images, in my mind, it is apparent that the students took the “History lesson” in stride with the anticipation of making tribute pieces to a woman of the past, an individual who is far-removed from their (students’) immediate lives. History was made relevant via knowledge visualization and ownership of “product” – the Digital Art. “MEE” – Motivation, Engagement, and Empowerment – comes to the forefront as a direct result of maximizing cognitive learning through knowledge visualization.To ensure student success: 1) innovation must comprise cognitive and creative planning that effectively meld core subject content with technological hands-on opportunities to motivate, and engage the student; 2) and best practices must show relevance and a sense of ownership for the assignment or project to empower the student. The students accomplished a great deal with me via Technology Applications for several reasons – the main one being hands-on with hardware and software that paralleled their “wired” world as “digital natives”. Another important reason was due to the eclectic nature of the curriculum planning and knowledge visualization. And another significant reason was the fact that the students were given the opportunity to take control of the learning process – make the assignments their own in terms of relevance and generation/creation of “product”. The creation of “product” – and in many cases, Digital Art (Art for Art’s sake as a byproduct) – was the key in moving the students in the direction of desire for the assignment. They were motivated to study, and produce with the anticipation of ownership via “product”. Again, they were given the opportunity to explore their “conceptual self”/creative side based on the assigned content – much of it, core. When we view the above images, the creative process is “alive and well”. The left image – Celestial – is remarkable for its representation of the word and its numerous layers with various filter treatments. Not only did the student have the wherewithal to use repetition, but also a different filter treatment for each repetition. The same can be said for the right image – Echo – but an additional, creative force is at work – using an image in receding fashion to indicate the word meaning in a dramatic way. As we all know, an echo tapers off – gets weaker. The crux of the aforementioned is that the students went much deeper conceptually and aesthetically via knowledge visualization as compared to a surface result of writing down the meaning of the words. The above images (top – Jocelyn Arredondo; bottom – Cyntia Estrada) are Web banners or banner ads (2008-2009 school year) that are seen on most websites for advertising and to generate revenue per click. Knowledge visualization allowed these students and their classmates to have a greater understanding of advertising production (copywriting) and its economics on the Internet. The creative process as defined in the classroom is allowing students to tap into their subconscious via intelligent and conceptual curriculum planning – giving them the opportunity via hands-on activities (in this case, hardware/software) to visualize assimilated content for greater understanding and retention – of knowledge. They need to be in control to expound upon the guidelines of the lesson plan. The above images (left – Denorah Espinoza; right – Jasmin Perales) indicate what’s possible via knowledge visualization. They and others were made by seventh grade students during the 2009-2010 school year as “product” (Digital Art) – the result of extensive research about Paul Revere and Early American History. The left image is remarkable for its treatment of the portrait of Revere – color scheme, layering, repetition, filtering and the brilliant distortion and transparency of the larger portrait. The right image is remarkable in its own right for the opposites in profile of the portrait of Revere and the ingenious treatment of using the portrait as a paint brush to create the tiling effect. Again, the crux of the aforementioned is that the students went much deeper conceptually and aesthetically via knowledge visualization as compared to a surface result of taking notes. The creative process can be broken down into four distinct processes – according to authorities over the years: preparation, incubation, illumination, and implementation. To transition these processes to the classroom for full benefit of the students – to “awaken” them – relies on the conceptual “nature” of the teacher and his/her ability to convey/facilitate. Without this input from the “front end” – critical, curriculum planning – there will be no “back end” – knowledge visualization for greater understanding and retention of lesson plan content. Several of these student presentations were used as a part of this teacher’s (author’s) presentation – “Technology and Creativity in the Classroom” – at the Region 4 Science Conference, Houston, Texas, February 20, 2010. The creative process is very much at work in the above project and with a practical bent that equates the difficult topic of Science with the psyche of the student – via knowledge visualization – for greater understanding and retention of content. Animation is at a high degree of play – similar to the stimulus provided in gaming, perhaps – to motivate others (students) to study the various concepts of Science. So the creators of the presentations also become teachers for their peers. Not only have they (creators) maximized their cognitive learning through knowledge visualization, but also generated “product” in an applicable sense for others to use and learn from. 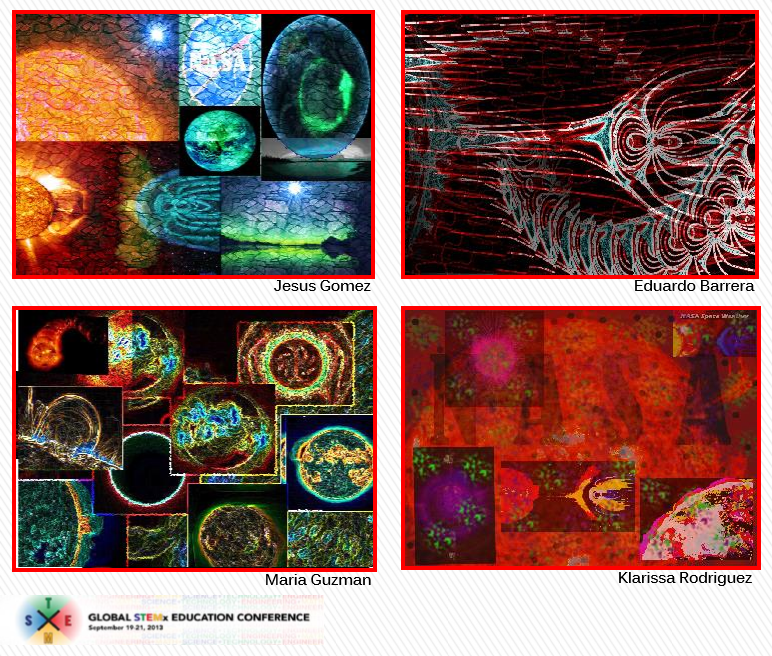 The above images (left – Nicole Baltazar; right – Mirna Morales) indicate what’s possible via knowledge visualization. They and others were made by eighth grade students during the 2010-2011 school year as “product” (Digital Art) – the result of extensive research about American History. The left image is remarkable for its treatment – color scheme, layering, filtering and the brilliant use of contrasts – lights and darks. The right image is remarkable in its own right for the line treatment and transparency of the portraits of James Madison and Thomas Jefferson and the ingenious painting of the background with “Red, White and Blue”. Again, the crux of the aforementioned is that the students went much deeper conceptually and aesthetically via knowledge visualization as compared to a surface result of taking notes. Again, the creative process is very much at work in the above project and with a practical bent that equates the difficult topic of Mathematics with the psyche of the student – via knowledge visualization – for greater understanding and retention of content. Animation is at a high degree of play – similar to the stimulus provided in gaming, perhaps – to motivate others (students) to study the various concepts of Mathematics. So the creators of the presentations also become teachers for their peers. Not only have they (creators) maximized their cognitive learning through knowledge visualization, but also generated “product” in an applicable sense for others to use and learn from. The students were asked to interview their parents (take notes), convert the notes into third-person stories, read their stories onto a voice recorder, combine their voice recordings with music via Audacity (sound editing software), and then use their voice/music combinations with photographs via MovieMaker to produce movies (slide shows). The interview process helped them gain confidence in having dialogue with adults, the notes conversion to a third-person story honed their writing skills, and the multimedia approach immersed the students in sound and movie editing software to hone their digital production skills. It was mentioned that they were involved with a production process that is practiced worldwide in various industries that require sound and movie editing. I believe that this project – “To know one’s parents …” – moved the students towards seeing their parents in a different light. The project went beyond “Maximizing Cognitive Learning through Knowledge Visualization” – it took this in hand, but also moved into a realm of enhanced awareness about themselves (students) and their loved ones. To combine the Arts with STEM is to motivate, engage and empower students to pay attention to and understand/retain content in the Sciences, Technology, Engineering and Mathematics. The creation of art … the making of something that comes from “within” … has always been a boon for the psyche, a gratifying experience that adds to self-esteem and provides relevance … meaning. This creative and cognitive experience is surround and exciting, which leads to greater understanding and retention of content and an appreciation for STEM and its motivating component, the Arts … STEAM. The Arts I will be discussing as the motivating component will be the Digital Arts … manipulating research images in graphic arts software such as GIMP, a Photoshop freeware equivalent. The key factor in all of this is the teacher being willing to learn and teach the software to the students so they are empowered to use their creative skills to visualize STEM content, in this case, Space weather and the upcoming NASA Magnetospheric Multiscale 2014 mission. Let’s take a look at a few examples of my 8th grade students’ work, 2011-2012 school year, which are a result of extensive online research about Space weather/NASA MMS mission and utilization of the tools/filters in GIMP (graphic arts software). to view examples and read more about the incorporation of the Digital Arts as part of the STEM process. “Moving STEM Towards STEAM” was presented as a part of the STEMx13 Global Education Conference (September, 2013). STEAM, the incorporation of the Arts as part of the STEM process is necessary. It is VERY important. The creation of art … the making of something that comes from “within” … has always been a boon for the psyche, a gratifying experience that adds to self-esteem and provides relevance … meaning. To combine the Arts with STEM is to motivate, engage and empower students to pay attention to and understand/retain content in the Sciences, Technology, Engineering and Mathematics. A theater mask … an art piece in itself … is the means for the performer to understand and translate the drama and/or dance on stage. So is the art piece that is created in the classroom by the student to understand and explain subject content. This creative and cognitive experience is surround and exciting, which leads to greater understanding/retention and an appreciation for STEM and its motivating component, the Arts … STEAM. Knowledge of Space weather and the NASA MMS mission will always remain with these youngsters because of STEAM and the student workshop. Underlying this process and activities is the sensitization to careers in the Sciences (Space Science), Technology, Graphic Design and the Arts. Aliteracy (Alliteracy) is the state of being able to read but being uninterested in doing so. This phenomenon has been reported on as a problem occurring separately from illiteracy, which is more common in the developing world, while aliteracy is primarily a problem in the developed world (Roger Cohen, “The Lost Book Generation”, The New York Times, January 6, 1991). I engaged students at Raul Yzaguirre School for Success (Houston, Texas) via project-based activities that related to Technology Applications standards and the information within the pages of the prescribed textbooks. There is one important thing that I did with the textbooks that I think all teachers should do. I took them through the chapters in procedural ways and via oral quizzes that helped them find information and quickly. This began to combat aliteracy as well, placing students in a situation in which they had to find the information (answer) based on dictation of a particular question. It is amazing how many students could not seem to find the information, even though it was right in front of them. And it wasn’t because they couldn’t read, it was because they didn’t want to read, and they had never been taught or guided on how to use the organizational aspects of textbooks (any book). I immersed students in various projects that centered around relevance and visualization of content … exciting and motivating for them … and they were also required to do research, which required reading, to support the projects. They took the reading in stride … moved away from their lethargic and alliterate behavior … because of the nature (mode of application) of the projects. Content relevance, hands-on hardware/software and the anticipation of “product” (end result) were motivating factors in combatting aliteracy amongst the student population. Of course, another positive aspect of the projects process was the fact that the students were also combatting illiteracy by doing a great deal of writing in response to their findings. Again, the students took participation and contribution in stride due to how the curriculum was delivered. Motivate, engage, and empower translate as MEE, and this holistic approach to the student psyche will nurture the “id” of the individual via innovation and best practices inside and outside the classroom. To ensure student success: 1) innovation must comprise cognitive and creative planning that effectively meld core subject content with technological hands-on opportunities to motivate, and engage the student; 2) best practices must show relevance and a sense of ownership for the assignment or project to empower the student. Challenging the student to take control of the learning process is tantamount to his or her enthusiasm for and desire to want to know, and complete the task. To take control is to own, and to own is to establish relevance, and give purpose to the process. What is missing in the majority of classrooms today is the address of this sense of “me” [the “id”, the self-centeredness that dictates a youngster’s being] that will transform his/her internalization to one of externalization. This transformation process in an educational sense is one of situating the student in a learning environment that will respell “me” as MEE. In other words, precise motivation and engagement via cognitive and creative planning and technological hands-on will empower him or her to want to learn within the context of doing it his or her way that will provide meaning and excitement and ownership in the finished product. Add to that an element of transcendence. By finding ways to display student work in public places, students learn that their work is relevant. This in turn builds greater confidence, and enhances a student’s self-worth. When real world situations become part of a student’s learning path it may very well beckon the him or her to begin to think about his or her goals and role in society. And this kind of thinking is a direct result of the student taking control of the learning process. As a “digital native”, today’s student walks into the classroom eager to use technology tools within the curriculum. He or she has high expectations in this regard. If these expectations are not met by the teaching staff and administrators, the “id” of the individual student will not be nurtured at optimal levels. The overused adages of “tune in”/”turn on” and “tune out” are indeed significant for today’s classroom because students have strong reactions to the digital versus non-digital world. As mentioned, when a student walks into the classroom from a world [digital] that he or she “tunes in” and “turns on” to at his or her discretion, and if the “world” of the schoolhouse is not conducive to who he or she is via his or her desires and activities, he or she will “tune out”. Typical vocabulary building begins with looking up words in the dictionary for their meanings, and this approach was used initially with this assignment by having students go online and look up the definitions for their assigned words in order to learn word meanings. Retention of this understanding was the important component, and a second approach was used by having the students visualize the meanings in GIMP [freeware; Photoshop equivalent] to begin to move towards remembering the word concepts, and also create digital art … a “product”. By creating Science Power Point Projects, students used PowerPoint to create presentations based on TEKS/TAKS Grade 8 Science concepts. They were challenged to take control of the learning process and make science more exciting and interesting to study. They researched the concepts online, and then used a combination of visuals, text and animation to bring their ideas to “life”. The kinetic aspect of animating with text and graphic components was integral to the production process. The students took ownership of static content and made it their own by using the same digital concepts for their school projects that they were already using on personal projects before and after school. The students took the Science assignments in stride. Due to the digital nature of the project and hands-on hardware/software, they were able to showcase content, and generate “product”. Eighth grade students were asked to explore their lives from past to present via a resume outline to begin to prepare for entry into high school as freshmen. During the process, there was a realization that their participation in and contributions to the educational process along with various achievements and accomplishments over the past eight or nine years had merit and meaning towards their futures as they continued through high school and on to college. When they sat before their resume outlines getting ready to transfer their information over to a more formal resume format via a Microsoft Word template, there was a sense of awe, pride and self-worth as they reviewed their listings of objectives, schools attended, accomplishments, skills, work histories , such as babysitting, community work, or helping others, hobbies, interests and references. Even at the “tender” age of 13 or 14, their listings proved to have meaningful content with various building blocks set into place. They could sense the building blocks within their listings, and one student to prove this said that all he would have to do as he progressed through high school was to update his resume he was currently working on so he would be ready for the college application process. This exercise in self-exploration proved to be a worthwhile endeavor as it related to empowering students to want to continue their educational process to be able to update their resumes as they progressed. This thought alone is a very important one as we all strive to move forward and upward through society with our resumes in hand. I mentioned to the students that over the years, I had used my own resume close to thirty times to obtain various positions in the U.S.A. and abroad, not to mention that I kept it updated on almost a monthly basis. I showed them my resume and they all understood the importance of this kind of document throughout a lifetime. Seventh grade students acquired web page building skills in HTML source code writing to incorporate web-based stories for children. The story writing was based on children’s books that target 2-, 3-, 4-year olds to teach this age group morals and values. The students were tasked to write original stories that had a message, and then moved their stories into Web page format in combination with visuals/artwork and through the use of hyperlinks to navigate between pages. A core group of seventh grade students traveled to Harmony Hills Elementary School in San Antonio to mentor third grade students in the use of graphic arts software to create Digital Art within the core subject of social studies. The RYSS students had learned how to use the software in my technology applications classes. This mentorship process involved an intensive session of learning and practicing, and project application.